Much has been made of the film’s connection to the Alien franchise, but for critical purposes, the more apt comparison is actually another Ridley Scott sci-fi classic: “Blade Runner.” That film is one of cinema’s greatest explorations on what it means not only to be human, but to possess life, and in “Prometheus,” Scott returns to similar thematic territory. 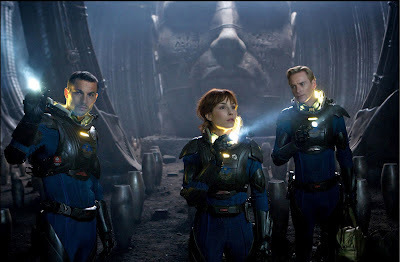 The crew of the titular ship is on a mission to find humanity’s origin; archeological finds have indicated humans are connected to a far-distant star system, and so the Prometheus is sent to investigate. I will try not to spoil any further, for the film’s wondrous sense of discovery is one of its greatest strengths, but I think no one will be upset if I add that the mission does not go off without a hitch. The characters wish to explore this world due to deep-seated drives we can all relate to. If posed with the chance to discover where we came from and why we were created, most people would venture into space, I think. That universal truth makes us immediately invested in Prometheus’ exploration, and as their mission becomes increasingly complex and dangerous, larger questions are brought into play: Can we say there is a God, finding scientific links to our creators? Who created those who came before us? Are our lives important, an act of divine providence, or are we mistakes governed by our own sense of self-worth? If so, how do we find meaning? These are the sorts of questions only good sci-fi can tackle, and as in the best sci-fi movies, I found my mind wandering as I watched, pondering these issues and many more. There is a wonderful sense of ambiguity to much of the movie that allowed me to do this. Big, earth-shattering revelations are hinted at, but not fully clarified; larger pieces of mythology are touched upon without being entirely fleshed out; character motivations and histories are seen through natural interactions, but never explained in detail. This is what the best sci-fi does: Give the viewer the basis for a much larger world and allow our imaginations to fill in the blanks and think about the meaning of what we have seen. When “Prometheus” is at its best, this is what it accomplishes, and there’s a good thirty-minute chunk near the midway point where everything comes together flawlessly. Big events start going down, but they feel miniscule in comparison to the mythology we’ve begun mentally expanding upon; that’s where the most meaningful of the film’s themes start solidifying, and for that time, at least, the experience feels revelatory. I’m much less sold on what goes down in the final act. I’m sure many audiences will be, but not for the same reasons. “Prometheus” refuses to spell everything out for us, just as it should, but ironically, I feel the film tries much harder to tie off narrative loose ends than it does to bring its thematic quandaries full circle. It’s nearly impossible to describe without spoilers, so allow me to put it this way: I don’t require narrative certainty from the ending. That only limits the boundaries of the film’s universe, and given what the film’s characters encounter at the end and the ultimate steps they’re forced to take, I do feel that too much is given away that would be better left ambiguous. In place of that, what I personally need to feel is a sense of emotional resolution, a spot I can point to and say ‘this is what all the film’s deeper questions were building towards,’ even if the answer is that there’s no answer. “Prometheus” doesn’t do that. It’s too busy bringing this particular, literal mission to a definitive close that it never reaches a point where I felt the emotional journeys of the main characters, or of the expedition itself, are fulfilled. The closest the film comes to achieving this is with the character David, a sentient android played by Michael Fassbender. David, like the humans, also searches for meaning in his creation; he was born from a race similar to his own yet ultimately disconnected, just like the humans, and as with the ‘real’ people around him, he’s searching for meaning in his own existence. The difference between David and the rest of the crew is that he’s had his whole life to ponder what it means to be ‘a creation,’ a concept those around him are only now having to deal with. Thus, the steps he takes to find answers are far more drastic, and the character becomes increasingly compelling with each passing moment. Fassbender is so good, in fact, that it’s almost inevitably every character around him feels underwhelming. David is a fully realized, three-dimensional idea, but even at their best, the other characters feel like semi-formed shadings. Noomi Rapace probably fares best in the lead role; as Dr. Elizabeth Shaw, she’s asked to go to some fairly harrowing places and delivers on every count. But the character’s motivations are sometimes murky, and we never feel connected to her the same way we do to Ridley in “Aliens” or Deckard in “Blade Runner.” That’s a crucial piece of the puzzle that’s missing, and it further lessens the impact of the ending. Idris Elba is probably the next runner up behind Rapace, doing some very compelling work in a similarly underwritten part. Other than those three, though, I found the rest of the cast either severely lacking, or frustratingly inconsistent; Charlize Theron, for instance, is quite good, but her character is completely useless from start to finish, and Guy Pearce, unfortunately, is saddled with terrible age make-up that dooms his performance from the get-go. But if the characters are lacking proper development, the world they inhabit certainly isn’t. 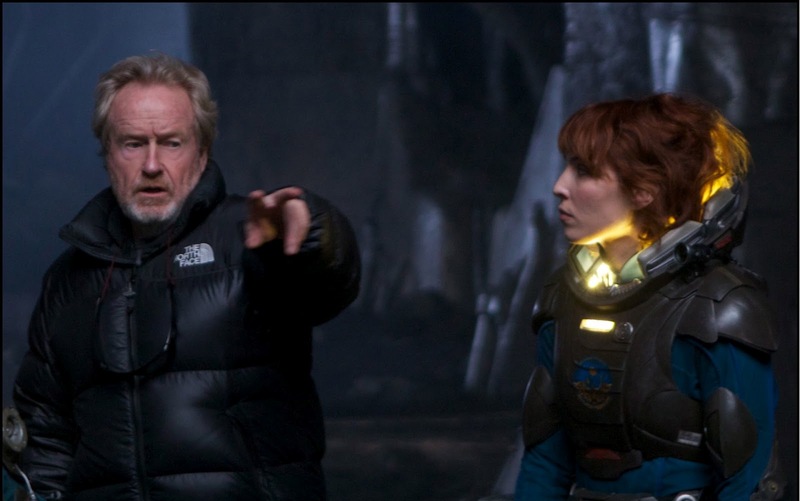 As with the best of Ridley Scott’s work, “Prometheus” has visual ingenuity to spare and unparalleled imagination. It’s not just the design of the ship, or the landscape of the alien planet; those are breathtaking and wondrous, yes, but it’s Scott’s ability to make this future feel like a natural, substantive progression of humanity’s current state that makes “Prometheus” soar. Every inch of the film’s design and mythology is rich with detail and authenticity, and the spectacular visual presentation only draws us in further. 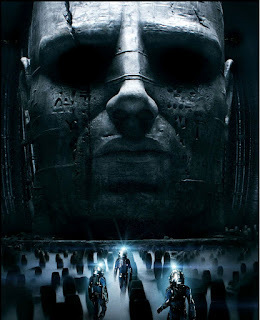 Dariusz Wolski’s 3D cinematography is spellbinding, one of the best uses of the 3D format yet; “Prometheus” takes place almost entirely in deep caves, cavernous spaces, and long foreboding hallways, and Wolski and Scott tap into the full potential of the third dimension to bring these places to life. “Prometheus” is not a horror film in the same way “Alien” was, but it provides plenty of pulse-pounding scares – including one of the most terrifying surgery sequences I’ve ever witnessed – and the pacing is spot-on from start to finish. Even as I recognized flaws in characterization and thematic development, I never felt anything less than riveted for two solid hours. Couple that with the film’s admirable ambition and big, thought-provoking ideas, and “Prometheus” is a movie I have absolutely no trouble recommending. I like your analyses, especially your insights into "Mad Men," and I think you're dead on describing this movie's ambitions. But this film was saddled with such an inept script that the big ideas are wasted, which is a real shame given the creativity on display here. Other commenters and sites will more than adequately cover my reservations, so I won't waste my breath on more than two examples (no spoilers, I hope). First, if this is a team of scientists, why don't they act like scientists? Instead they run around touching and poking everything in sight. Really? Sure, it's a challenge to a writer and director to make drama out of the deliberation and caution real scientists have, but that's also an effective way of building tension and it was totally neglected. That lack of realistic characterization keeps snapping us out of the movie. Second, there's a moment when several characters have to choose to make an extreme personal sacrifice. The whole scene is played straight out of the Shane Black playbook, complete with jokey asides, when the gravity of the situation and the consequences demanded a sober, affecting, even inspiring mood. The entire film is riddled with wasted opportunities. I so wanted to like this movie, but it's only worthy in fits and starts. When I woke up this morning I was still angry: that's $20 I wasted, two hours I'll never have back, and in return I get memory like a bad taste for the rest of my life. Gee, thanks.